Adult film star Stormy Daniels has been ordered to pay a massive amount of money to President Donald Trump in legal fees. ADULT film star Stormy Daniels must pay President Trump $293,000 in legal fees, a judge ruled today. "The US District Court today ordered Stormy Daniels (real name Stephanie Clifford) to pay President Trump $US293,052.33 ($A406,890) to reimburse his attorneys' fees (75 per cent of his total legal bill), plus an additional $US1000 ($A1388.46) in sanctions to punish Daniels for having filed a meritless lawsuit against the President designed to chill his free speech rights," Charles J. Harder, the president's legal counsel, said in a statement, according to Fox News. 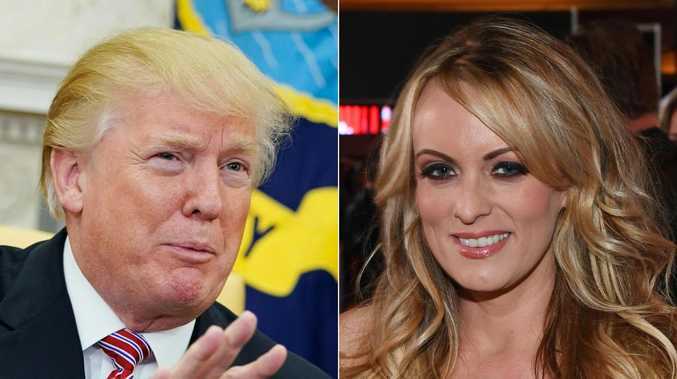 "The court's order," Mr Harder said, "along with the court's prior order dismissing Stormy Daniels' defamation case against the President, together constitute a total victory for the President, and a total defeat for Stormy Daniels in this case." Attorneys for President Trump had asked a court earlier this month for nearly $US800,000 ($A1,110,764) in lawyers' fees and penalties from Daniels for the failed defamation lawsuit against him. Mr Harder defended more than 500 hours his firm spent that rang up a nearly $390,000 ($A541,497.45) legal bill for the president and asked for an equal amount in sanctions as a deterrent against a "repeat filer or frivolous defamation cases."